Review – 27: Second Set #2 and #3 – Extra Early Review! 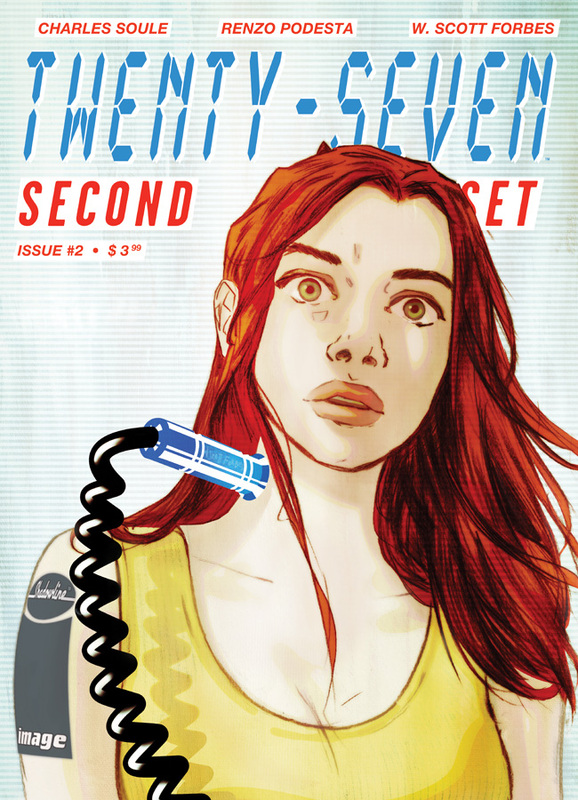 I’ve been a fan of Charles Soule‘s 27 when I first saw his pitch at the Baltimore Comic Con last year. The art was amazing and the idea of a series following a down on his luck musician hoping to make it to his 28th birthday was something I was familiar with and intrigued in how it would be depicted. Little did I know the story would be infused with mysticism, deals with the devil and a nice puzzle throughout. Fast forward to the second set and the mysticism and focus on numbers has been dialed down a bit. Instead we’re given a volume that’s focus is the character of Alex Garland and what it means to have a second chance. At the end of the first issue, Garland has revealed the board in his chest to the world with a rather impressive light show. He quickly rockets from being a musician who is working his way back to the top to instantly being the hottest thing there is out there. Garland has revealed to the world that he has a bizarre button implanted in his chest that gives him genius-level creative powers every time it is pushed. His fame has skyrocketed, but he’s already attracting unwanted attention: a 1980s one-hit wonder turned witch will do whatever she can to steal the button, even if it means cutting it right out of Garland’s chest! The idea of having this focus on one-hit wonders through the second volume is impressive and smart. Garland could easily go that route. He also could skyrocket to the spotlight by using the device in his chest. But in the first issue, we see him putting in the hard work. The second and third issue have a nice track running through them following Garland and the baddie. There’s the story of the world reacting to Garland’s reveal and then there’s Valerie Hayes, the one-hit wonder who wants Garlands power. He’s in the limelight again and she wants to be there. Garland made a deal to get their and is literally killing himself each time he uses his power, how far will she go? There’s just something that’s really fun with this second volume. I feel like I’m on the fame ride with Garland and there’s such smart commentary on that experience throughout, but it’s very subtle and not preachy. The nods of the hats to the one-hit wonders of the past is great as well. It starts from the covers and works it’s way inward. The art is unbelievable. There’s little out there that looks like this series. I’d hang these pages on my wall, the covers especially. If the story doesn’t get you, the art will. It’s beyond fantastic. 27 is a comic like no other. Unique story, amazing art the second and third issues are an absolute buy.